Santa Clause believes in Chuck Norris. Chuck Norris believes in breastfeeding. Why does it matter what Chuck Norris thinks about breastfeeding? A man who has a bear rug in his family room that is actually a LIVE bear that is just afraid to move is somebody whose opinion MATTERS. So we care what Chuck thinks about breastfeeding. ~Chuck thinks that it is 100% lame that hospitals have tons of info on how great breastfeeding is, but then undermine the breastfeeding relationship with tons of stupid policies. Chuck would demand skin to skin immedietly right after birth- Why? Because it is good for breastfeeding. Chuck doesn't need his baby weighed- the baby weighs the perfect amount, because it is Chuck's baby. ~Even though Chuck Norris doesn't actually need to eat (food just hides inside him for protection), he still knows that breastmilk is awesome food for babies. The Chuck Baby gets breastmilk. That is how you raise a healthy Chuck. ~Chuck loves breastfeeding because breast milk is full of LIVE enzymes, hormones, antibodies, and other fantastic stuff. Chuck knows that live food is good food. That is why he has such awesome abs. HELLO! ~Breastfeeding covers? Chuck uses one when Chuck WANTS to use one. If he doesn't want to use one- then he just NURSES. And even though people want to stare at Chuck Norris- nobody does. Nor do they make snotty comments. They know that the reason there is no sign of life on Mars, is because Chuck once went there. Chuck can even breastfeed in Target. ~Chuck knows that babies wean when babies are ready to wean. Even Chuck wouldn't take a breast away from a baby. He knows that babies start feeding themselves when they are hungry for something else. ~Chuck Norris won American Idol using only sign language. That is another reason why Chuck respects the breastfeeding relationship- he knows that mama and baby learn to communicate intuitively, beautifully, and seamlessly with one another without spoken words as they perfect the nuances of natural feeding. He knows that this is an invaluable gift they give each other. ~Chuck believes in extended breastfeeding. Chuck himself was breastfed till he was twelve... by the Statue of LIBERTY. ~Rice cereal? If a food has about zero nutritional value (unless mixed with breast milk) and possibly contributes to adult diabetes, would Chuck give that to his baby at four months? Or ever? I think not. ~Does Chuck mind if the baby mama nurses in bed with their sweet little baby? Not even for a minute. Even Chuck needs a little baby milky cuddle every once in a while. And co-sleeping with the nursing baby is perfect for sweet cuddles. 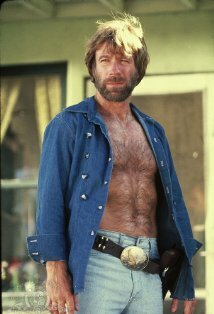 Disclaimer- I of course don't know, have never spoken to, or seen in real life, the notorious Chuck Norris. I do think he MUST respect breastfeeding because he seems like such an awesome guy. However the opinions mentioned in this post are mine and mine alone. Except he does think Hooter Hiders are lame. You made me smile Mama Birth.... Thanks! I think breast milk is the best comfort food available! LOLOLOL!!!!! The Statue of Liberty!!! Awwwesome. You are too friggin funny. You must continue this Chuck Norris thing. lol this was the best post ever to read while breastfeeding!! i'm gonna share this with a mama's group on facebook! i read the statue of liberty to my husband & he laughed hard. This was hilarious!! The Statue of Liberty was my favorite too! Great post! Thanks for the giggles!